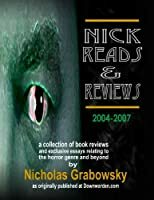 Since 2004, highly acclaimed horror fiction author Nicholas Grabowsky has reviewed books given to him from authors and their agents and publishers large and small, paying particular attention to what the smaller presses have to offer. Never reviewing for payment or profit, he used these reviews as a dscipline towards maintaining a reading schedule and as writing excercises, to critique and advise and express honest opinion, and to get lots of free books. These reviews comprise the first three years as originally published at www.downwarden.com, complete with new essays exclusive to this book.